Heat oven to 400°F. 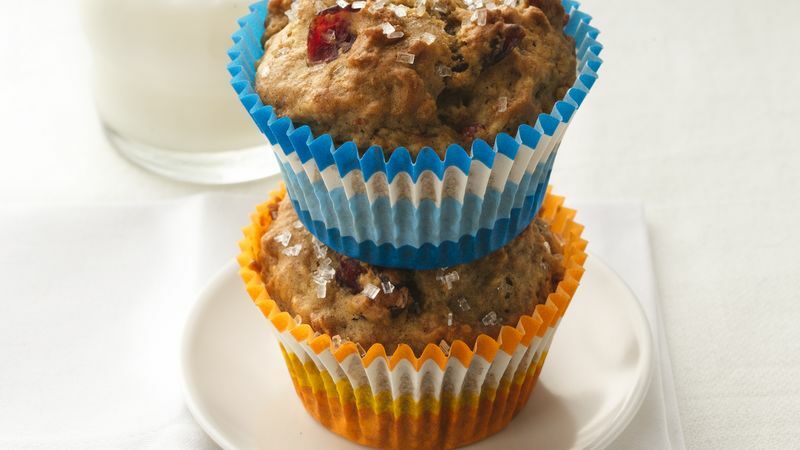 Place paper baking cup in each of 12 regular-size muffin cups; spray bottoms with cooking spray. In large bowl, mix applesauce, milk, oil and egg until blended. Stir in remaining ingredients except coarse sugar just until moistened. Divide batter evenly among muffin cups. Sprinkle with coarse sugar. Low-fat muffins sometimes stick to paper liners. A quick spray with cooking spray helps solve that problem, and the muffins release easily. Eating at least 3 servings of whole grains daily may help reduce blood cholesterol. Look for the word "whole" to be sure you get the whole grain.